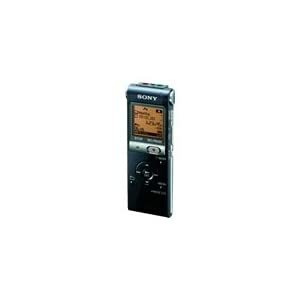 I have always wanted to get my hands on a voice recorder, like the ones writers or reporters used in old movies for interviews. They seemed so handy and special, being able to hold tiny bits of moments in your life that you could replay. My sister got one yesterday for a meeting she wanted to record. Not the exact model, but just as attractive! Once my sister brought it home, we both started playing with it, testing out how well the sound played back when recording from different distances. It performed very well, even when I spoke softly a few feet away. This is truly a professional device, and worth all the money it cost. So what can it be used for? Other than personal pranks and singing, it also can be used to interviews, meetings, lectures, possibly concerts (have yet to see how well it’ll record in a crowded booming room), or even daily settings when you want to record somewhere you have been. You can also record a song you hear somewhere and then turn it into an mp3 file when you get back to your laptop. Now let’s say you don’t want a recorder because your phone/camera does everything you want anyway. For the future mishaps here is a student discount to help you out. With the arrival of Spring, also comes the innate urge to go out more and soak of the sunshine. However, not everyone can afford events. Believe it or not, there is always something free to do in the city. A simple Internet search goes a long way. NYC The Official Guide is just one site I came across that effectively dispalyed what I was looking for- free stuff to do. They have a weekly updated list of free events in New York City to help give ideas for things to do for the price of nothing ( except possibly a metrocard ride). For this week of March 21-27, though much of the events have passed, some are still going on. Today March 26, Macy’s opens its flower show called Brasil: Gardens in Paradise. It will feature many beautiful, tropical flowers from the forests of Brasil. This will also be displayed outside of the Macy’s at Heral Square for pucblic viewing. Check it out for yourself. This exihibit will be up from March 25th to April 7th. Another event is for art lovers out there. Lisa Lebofsky has her debut in a solo art show. Her ethereal artwork uses the interesting combination of pain on metal. Her work will be displayed at the Milavev Hakimi Gallery from March 27 to March 31. Of course there are always more free things to do that are not quite as fancy but still enjoyable. 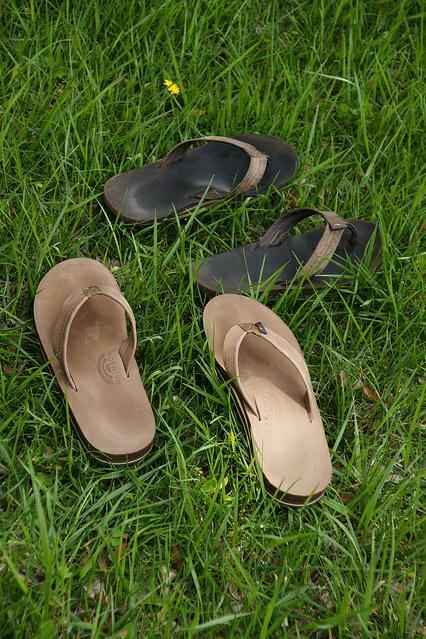 Parks are beautiful places to lounge in, even between classes, during this season. The Farmer’s Market in Union Square allows you the chance to try samples of organic food as well as offering some delicious items for cheap if you look hard enough. Cheap is the next best thing to free. Many places offer student discounts, so it never hurts to ask. Stores and restaurants near your school may do student discounts because of all the business potential they have being in close proximity to a university, so be sure to ask! So save and have fun and remember to check around for free things to do. Not everyone has to spend $13 dollars for a movie ticket to entertain themselves. As a college student, I can understand the struggles of not being able to afford anything. But I, and many other American students, have the luxury of having parents who help out with purchases that are needed to get by. For people in many African countries, not being able to afford anything is a reality that isn’t going to be made better by parents who can afford to pay for their needs. Most African countries have corrupt government officials who pocket the money and resources that are supposed to go back into the public economy, which is one of the biggest reasons so many Africans live far below the poverty line. Women, in particular, face an even harsher struggle because women have no power. Many are forced into marriages, encounter violent brutality and have very little legal rights. Although these women struggle to meet their most basic needs, there are many organizations that help work relentlessly to help them gain access to the resources they need. Bead for Life is a nonprofit organization that helps women improve their lives and gain independence. The organization works with women in Uganda by running their organization like a business, except all of the profits made go back to the Ugandan women. 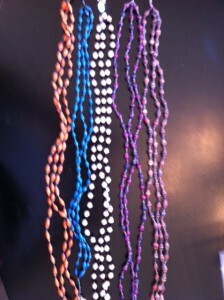 The way it works is the Ugandan women make jewelry out of colored recycled paper. They then hand the jewelry over to the organization workers who sell the jewelry on the Bead for Life website or ship out the jewelry to people who wish to host what they call “Bead Parties.” Bead Parties are are when ordinary people who want to help the organization, order jewelry, at no cost to them, and sell the jewelry to their friends and family and tell them about the cause. They then send all the money they made and unsold jewelry back to the home office and the money gets sent to the Ugandan women. The money helps the women get educated, including developing business skills, they can purchase or get the funds to build their own homes, pay for their own food and supplies, and take care of their children. The jewelry is beautiful and inexpensive. I’ve purchased two of their bracelets. These bracelets, the Sanyu (Lugandan for 'joy') bangles, are $5. These bracelets, one of the most popular jewelry items, make great gifts and go with any outfit. I participated in a Women and Activism Fair on my college campus and I got to sit at a table and sell some of the Bead for Life jewelry and tell people about the cause. It was a great feeling the expression on people’s faces when I told them the cause behind Bead for Life. They got excited that they could have the chance to help out the Ugandan women get the same opportunities that they had- the opportunities for education, and purchasing a home- all just by purchasing a piece of handmade jewelry. All of the jewelry is hand made from recycled paper and the detail on them is absolutely beautiful. The Ugandan women not only can make fair trade money but more importantly, they gain confidence and independence when making the jewelry because they are essentially working to help themselves, no one is handing anything out to them. They know that the pieces they are making are beautiful and they know that through their work, they will be able to provide a better life for themselves which makes it a satisfying experience to both them and for people like myself who are just trying to help the cause. So, if you’re looking to help a great cause and purchase some unique and inexpensive jewelry in the process, check out the Bead for Life site to get involved with the organization or to purchase jewelry and other items like all natural, handmade shea butter soap. All items range in price from $2 to $30 and a purchase of an entire collection of products is about $50 is you’re looking to get more for your buck. Having bought some jewelry myself, I can say that I felt so much satisfaction in knowing that my money was going to improve the life of another woman. 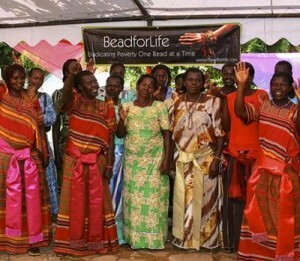 To make purchases and see where the money from your purchase will go, check out beadforlife.org. 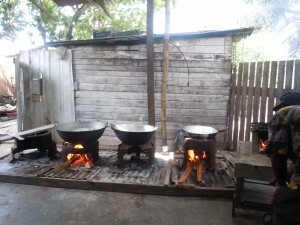 Last summer I went home to Guyana to visit my family. After a six hour flight from New York to Georgetown, followed by a thirty minute boat ride to the coast, then a twenty minute car ride to my village, I was ready to be embraced by my adoring aunts and cousins. I arrived to a frenzy of activities in the village; women in fast paced action, running with pots and baskets of vegetables, and men unloading chairs and fixtures from trucks and donkey carts. The center of this clamor was a house next to my aunt’s. I continued to stare while walking backwards into my aunt’s house. The door was open and as I called out I realized no one was home. At that point I was no longer tired from my journey and I knew exactly what was happening. There was going to be a wedding that week. I proceeded to the house next door, and sure enough, I found my aunt and cousins. Upon seeing me, they dropped the decorations from their hands and ran to me. They held me in a tight embrace while apologizing profusely for not being at the house to greet me. A typical Hindu wedding goes on for three to four days. In a small village, it’s usually the cause for celebration for everyone. Everyone joins in with the festivities and also with the preparations. My favorite part is eating. 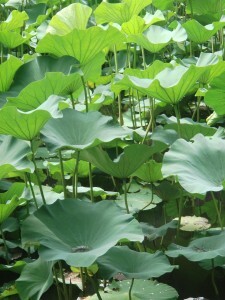 Traditionally the food is served in lotus leafs and you eat with your fingers. This is the stuff I live for, and I can’t tell you how excited I was to be there at that time. My other favorite part is the cooking. The men tend to take control of the giant woks. The women do all the prep work and the men do the cooking. Cooking for a wedding is done outside, in the backyard; after all you are cooking to feed an entire village. 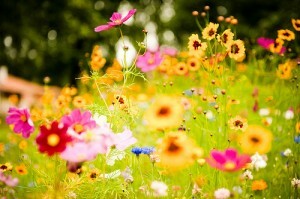 The First Day of Spring, Tuesday, March 20th, was welcomed with a huge helping of sunshine and fresh air. Spring kicked off earlier this year than in the past, meaning a brighter, warmer time for everyone this season. I left for work this morning in a long sleeve floral print tee, tossing on a dark gray hoodie just in case, and was pleasantly surprised by the sudden shift in temperature in just a mere two days. The weather dares me to slip into a pair of strappy sandals and rock the cat-eye sunglasses like a boss, a challenge I gracefully accept with the coming months of clear skies and occasional breezes. I prepare to retire my favorite leather boots in favor of Rainbow flip flops, sandals that pile up in front of every Southern Californian’s door mat. Biking around Central Park. Watching the sun set over the East River. Eating a not-quite-yet-defrosted ice cream sandwich in front of the Bethesda Fountain. These are all the things I’ve done since winter has slyly slithered away with its tail tucked between its legs. With the exception of the $4 ice cream brick, the newfound sun is promising. The liberation from wooly socks is refreshing, as are the crisp breezes that send a chill through my fat stubby toes. My sandals harbor no bitterness while they’ve been in storage for the winter months; in fact, I swear they hugged me when I took them out for a brisk walk to the market. As confident as I felt, no pair of sandals is complete without a clean set of digits. Vada Spa has got you covered with a full array of beauty services. For beach babies looking to hit the waves, you can get a Brazilian or full leg wax special for just $18. To top it off, get your toesies in shape with a pedicure for $18 as well; don’t forget that a hot shade of nail polish goes a long way on your toes! These student savings are available on Tuesdays, Wednesdays, and Thursdays with your student ID. Take advantage of the quickly-rising Spring heat with Campus Clipper student discounts today! Go get your beauty on, girlfriend (or gentlemen. Hey, even guys need a spa day)! New York might well be one of the best places in the world for food. The City has been the gateway to the USA for over a century with over a third of all Americans able to trace their ancestry through Ellis Island, and with such an astonishing mix of races and peoples from all over the world, diversity is the watchword in NYC. It’s no surprise that all these peoples kept their local cuisines going – many of them have managed to keep whole languages going! With so much choice in food in New York, it can be hard keeping track of it all. You would certainly be forgiven for thinking that Pizza was devised here, the way it has taken hold… But the only, really, truly American food, has to be the humble hamburger, which like so much of US culture, seems to have gone on to dominate the World! Like all food that has found its way to New York, it seems to be popular, and there are now so many interesting hamburger restaurants and joints, and variations on the concept it can be impressive, if not rather overwhelming. I had the pleasure recently to try one of the newest and more rapidly developing restaurants selling their own version of this timeless classic, Bareburger. 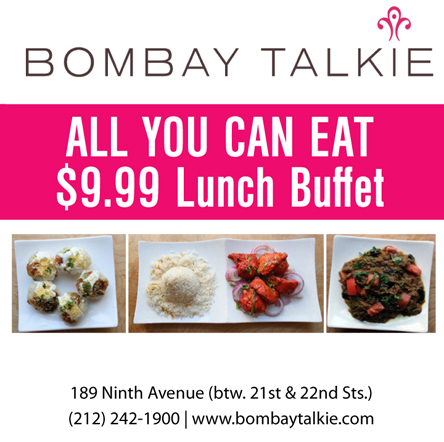 After an initial start in Brooklyn, this small but rather excellent little chain is now franchising across the city. 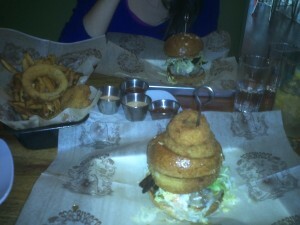 I had the pleasure of trying it at 85 2nd Ave along with my better half; Bottom Line Up Front: Tasty burger. Do you need to know more? Aside from the content, there is also the style to consider, with a further fourteen menu choices for your burger. 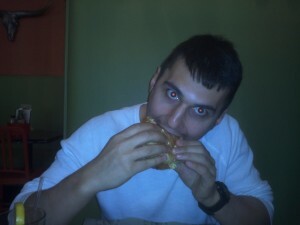 I took the ‘Supreme’, while my date went for the Maple Bacon Cheeseburger. We were not disappointed at all. The presentation was really excellent and both burgers were juicy, tasty and different enough that we could be certain Bareburger has its own signature and style. The food came in the classic basket, with a simple bu t very effective selection of sides – we took the onion rings and fries. Even the beverages were organic, and my blueberry soda went really well with the whole meal, that unusual, organic edge of a healthy drink (without being so-called ‘health food’) perfectly complimenting the natural food. You do not get hamburgers in the UK like you do in New York, and I love them. I have a running list in my head of the top 5 places, but it just doesn’t seem like enough (or even reasonable to try and rank them! ), and now I have another one to juggle in there. Bareburger has nine (soon to be ten) outlets across the City. If you like your hamburgers, if you like to support good organic food, and particularly if both, you need to check them out. 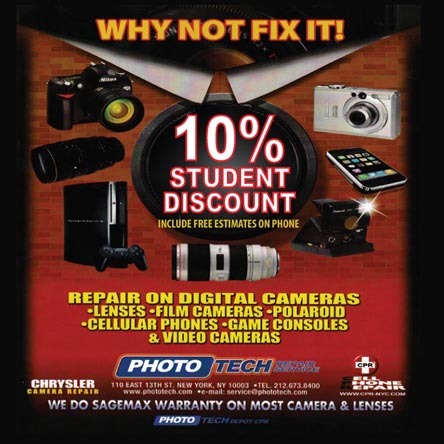 We have a student discount coupon for you right here! I love cake. I’m not sure if there’s anyone who doesn’t and if there is, don’t call me. Cake is the one thing we should all be able to agree on. Apple Café Bakery, located at 24 West 8th street (between 5th avenue and Macdougal street) provides cake and so much more. I stopped by one beautiful afternoon and enjoyed a sample of their delectable menu. 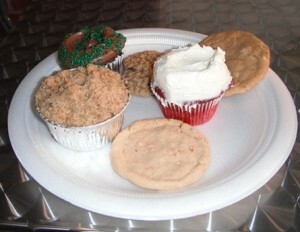 What you see on my plate is an apple crisp, a red velvet cupcake, a chocolate cupcake and three cookies- oatmeal raisin, peanut butter and white chocolate. I started with the cupcakes- they were delightful. I have a lot of feelings about the frosting to cake ratio and Apple Café Bakery gets it just right. 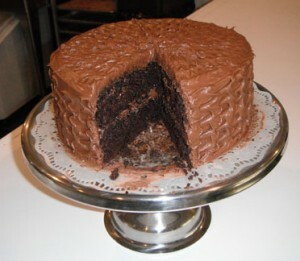 The cake is light, warm, fluffy and feels like heaven in your mouth. The cookies were warm and chewy. The white chocolate melted in my mouth and the peanut butter had peanut chunks in it to give it some crunch. The apple crisp was wonderful as well. The sweet cinnamon apples blended perfectly with the crumbly crust. Apple Café Bakery also sells cheesecakes, pies, pudding, muffins and brownies, all of which I would have gladly tried if I had a second stomach. The owner Alhagie Jallow (he goes by Al for the benefit of his American customers) and head baker Babu are very friendly and make each patron feel like a member of the family. 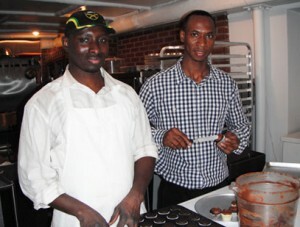 Al is originally from Gambia and is currently taking classes at Hunter College. It makes perfect sense then, that his bakery would be such a welcoming place for students looking for a study break. 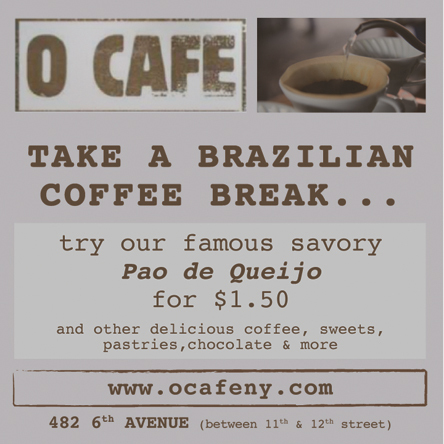 Located a short walk away from NYU and the New School, Apple Café Bakery is a great place to get some work done. There is free WI-FI and you can enjoy coffee, tea and the smell of freshly baked goods while you work. 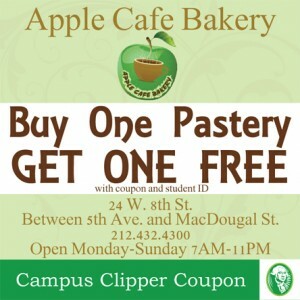 Even better, there is a coupon for Apple Café Bakery in the Campus Clipper! You won’t be able to just have one cookie so go ahead and indulge. The second one is free! Al (right) and Babu ice a freshly baked batch of mini cupcakes. I travel around 34th street a lot, mostly because of the many stores I can go through. I notice there are a lot of stores that say “sample sale” or “wholesale only”. Which brings me to the question: what is the difference between a whole sale and a sample sale? Now, while these are no-brainers to many people, for the longest time I was completely unfamiliar with these terms. Going into one of these stores, you see a small amount of several items along with tags on each. Some items are wrapped together in a plastic covering, others are hanging separately on a beam against the wall. There is no music and the place over all feels slightly dingy but gives you the sense that you might find a deal here. Wholesale is when stores buy large quantities of items from manufacturers and sells it in smaller bulks to retail stores. This is mainly used for smaller retail stores to get good quality items for cheap. If you go to shop here and don’t plan to buy in bulk, you should probably go elsewhere. However, some stores will sell individual pieces. Chances are though if it says “only wholesale” don’t bother. Claim what is rightfully yours! It used to be a term for when designers would sell pieces from their collection to show at retail stores at the end of a season. For the public, these items would sold at wholesale prices and would be limited in selection. However, now it has turned into more of a stock sale, where left over inventory is given to stores while being sold at a fraction of the price. Generally, there is only one type of size and they only take cash. For a third type of sale (just to keep boggling your mind) there are warehouse sales. Recently, American Apparel had a warehouse sale, selling their items at crazy discounts. The main difference is that the items being sold are usually items that have been on the shelves and this event is similar to a final clearance. They usually, but not always, take credit or debit. There has been an online movement for sample sales where there might be some membership authorization involved. Overall, the selection is less and items go very quick. How to find one of these sales? Online you can do a search or if you know a friend/ family member in the field who can clue you in. Some places you can subscribe to them to get emails of events. As for shopping at a sample sale there are some helpful tips here: http://www.thebudgetfashionista.com/archive/sample-sale-shopping-tips/. For those of you want more savings on clothing, here is a student discount for Hillary Boutiques. My expectations were built up. And they were met. 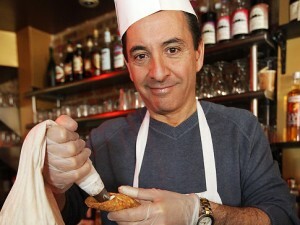 I was unsure of why Caffé Palermo in New York City’s Little Italy called him “The Cannoli King.” Then I tried his cannoli. It’s all clear now. That's no chef's hat, that's a crown! 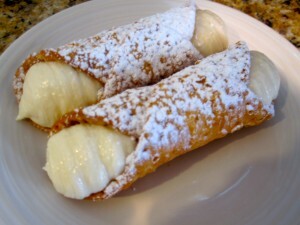 I define a cannoli as “delicious.” The vanilla cream and crispy pastry tube was just what my sweet tooth was craving, and not too rich, or too sweet– just perfect. The cannoli cost me $4.75, so I the only thing that would’ve made it sweeter is if they had some student discounts! 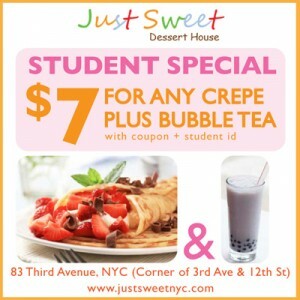 If you have a sweet tooth like me and love awesome student discounts in NYC, then grab the student special at Just Sweet Dessert House, downtown! Being in a relationship is hard. Being in a five year relationship when you both have full schedules with little extra time to spare- now you’re just talking crazy. But it’s possible! I’m proof! And now I’m going to spend the next 400-500 words talking about all the wonderful things about love and rainbows and cupcakes. Did I mention my boyfriend is a saint for putting up with my sarcasm for this long? So, I find myself in a long term relationship or as my boyfriend and I like to call it, “The Long Haul” and I think I made it clear that I won’t be talking about all the good stuff. Nope, I’m going to cut down to brass tacks here. Relationships are hard and real unless you’re Kim Kardashian and believe in the power of denial and illusions, just saying. It’s not all the charming qualities about your partner or the way they look into your eyes and tell you that they love you (cue my gag reflex). No, it’s all about the fun. It sounds silly but ask anyone in a long term relationship or marriage and they’ll tell you the same thing, granted slightly variations of fun and maybe still not okay with the passing gas in front of each other part, but you get my point. 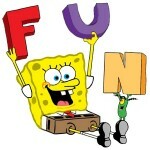 Fun is the essential part to not just romantic relationships but any relationship really. Now before you laugh at me for being 22 years old and still knowing the words to that song from Spongebob, here me out. When choosing a partner, do you want to be with a jolly, optimistic and fun Spongebob or can you really see yourself living the rest of your life with a total downer like Plankton? And if you happen to be content living with a Plankton, then I’ll make it a point to buy you some wrinkle cream for your next birthday for all those frown lines you’ll be getting soon. People who have fun with their romantic partners, no matter how long they have been together, tend to be happier people- with fewer wrinkles in the long run. 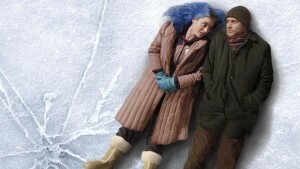 We all hear the stories of the ‘ol’ ball and chain’ but I say it doesn’t have to be this way, just remember fun. And having fun doesn’t mean you have to file for bankruptcy. There are lots of great ways to have a great time in the city for close to nothing. For example, The Brooklyn Botanical Garden offers free entrance on Tuesdays and discounts for student tickets on any other day. 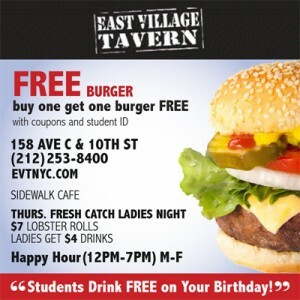 To top off a trip to the BBG, you can head over to East Village Tavern for buy one get one free burgers! Be sure to print out the coupon below and bring your student ID and check out the Campus Clipper for other student discounts for good eats and more fun.